About my Daniel Smith's pigments. DANIEL SMITH's pigments are available at Biblairie GGC's! 1567 King ouest, Sherbrooke, 819 566-0344. DID YOU KNOW why Daniel Smith's pigment are so enviro-friendly? because they rejected all the traditional methods of making the pigments and re-tought the whole process using less or no polluting methods or materials. Cadmiums and oxides are very polluting and toxic. They are experimenting with other methods to acheive the same results (and even better) to reduce polluting methods. They can acheive brilliance and transparency, permanent and enviro-friendly pigments by refrigerating the complete process of fabrication. This keeps the pigment alive, fresh and vibrant. 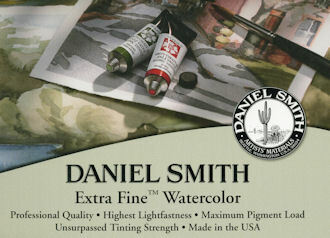 Today DANIEL SMITH is known worldwide as a manufacturer and retailer of top quality artists' materials. But back in 1976, the whole company consisted of Dan Smith himself and one used three-roll mill. Dan began making ink because, as a printmaker, he saw a need for printing inks geared to the needs of fine artists. Later he started selling support materials such as paper and etching plates, and from there the company grew into a full-service art supply store. A lot has changed, but making innovative, top quality art materials is still our primary concern. "I love making stuff-that's the best thing of all as far as I'm concerned," says Dan. Our reputation is built on the uniqueness of the product we manufacture and the consistancy artists have come to trust - we would have it no other way. Imagine a place where tradition and innovation collide, an arena where artists and scientists partner to create colors that have never been seen on the tip of a paintbrush or rolled onto a printmaking plate. At DANIEL SMITH Artists’ Materials we take pride in the artisans that create our finest quality paints and inks, right here in our Seattle headquarters. Our manufacturing laboratory is the soul of our company. It is here where ideas are shared, artists voice their opinions and new colors are brought to life through extensive testing and refining. From our exclusive PrimaTek natural mineral pigments, to our modern Quinacridones to our centuries-old Siennas and Ochres, each color we offer has a story to tell. Each story is retold using the highest standard of excellence in manufacturing. You can be sure sure that when you tell your story, the consistent depth, versatility and character of DANIEL SMITH Extra Fine Watercolor will add a richness as good as you can imagine. After nearly two decades of bringing the highest quality inks to the print-artist community, Daniel Smith rose to a new challenge. He set out to create a line of professional watercolors with one goal in mind: to bring you the very best. In 1993, his dream came to fruition with the introduction of a hugely innovative American-made collection of paints that just happened to change the world of watercolors forever. After extensive formulation and artist testing, we introduced the first 27 Daniel Smith Extra FineTM to the market with exciting results. The sheer amount of pigment packed into each tube was exceptional, as was our policy of providing complete product information on each label. Loyal customers to our Seattle stores and catalog set about buying and trying the new paints and colors, they told their friends, and it was soon evident we had a smash hit! Daniel Smith currently offers over 200 different colors, with more in the works every day. The sheer range of possibility they offer is endless and unparalleled in the industry. Our amazing selection spans the spectrum from the historical, to our natural earth and PrimaTekTM Colors, to the brightest, boldest colors modern technology has to offer. While they are American paints, our pigments come from the world over: the Americas, Europe, Asia and Africa. The Daniel Smith paint-making lab is neither big nor impersonal. Next to our Seattle retail store is a world of machinery and color, where the air smells of linseed oil, and everyone’s clothes are splattered with paint. Our manufacturing lab is the soul of our company, a place where ideas are shared, artist’s voices are heard, and new Daniel Smith colors are brought to life by our talented and dedicated production team. Artisans making paint for artist, they have your complete satisfaction in mind. They oversee all, then tube and label each batch of paint by hand. 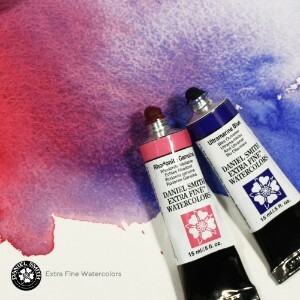 Our sincerest thanks and gratitude goes out to all who are loyal fans of our Extra FineTM Watercolors. We invite those of you who haven’t used them to try them. We believe you’ll fall in love too. This is an exemple of a sedimentary pigment. It creates texture by deposits in the paper crevasses. 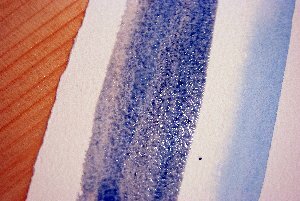 If you use such a pigment in your color mixtures, it will make that mixture sedimentary even if you use silky pigments. The inorganic (metallic) pigments are heavier than the organic (plants) pigments, so it deposits hitself in the paper crevasse and lets the others float above wich creates an illusion of color seperation. It is specially used for bark, sand, wood, trees, clay pots etc... look at a silky color aside. There are the organic pigments, who are either vegetal or earthy based. All the colors are organic exept the blues. all greens are transparent but very staining. Do your own tests to discover your palette's identity. Please do not buy on impulse just because the little square looks good. You have to verify the informations of each color. Is it permanent (will stay bright and unchanged for a lifetime) or fading? is it transparent (will let the light through to illuminate your painting) or opaque? is it staining or liftable? is it soft or textured looking? Most of the informations I gave you about color have been taken on a very rich website, DOTAPEA.com and on Pourpre.com go take a look!